My Rotary is an area of the Rotary International website where you will find Rotary related information for members only. To access this you will need to sign in first, or create an account. If you have not already done this registering is easy with this How to Create a My Rotary Account Guide (pdf). Once you’re registered and signed in you can access further links below. As a Rotarian you will hopefully wish to be engaged with all that goes on in Rotary. You can find many Rotary Groups with people that may share your own interests. There are also Rotary news items, online magazines and newsletters. You will also want to check that your personal information on the global database is correct. As a Foundation Committee member you will undoubtedly wish to have access to information about District and Global Grants, and see what your club’s Rotary Foundation giving trend is. Club Secretaries are able to amend club information about your meeting place as well as adding/terminating members to the global database. Marketing, PR & Communication Committee members may access the Brand Centre and download guidelines on Rotary branding and also images and logos for club use in your newsletters and other publications. Presidents and President-elects are able to enter your club’s annual membership and service project goals within Rotary Club Central, whilst all club members will be able to view these and keep track of your club’s progress in achieving them. Looking for new project ideas? Then have a look what other clubs are doing around the world in Rotary Showcase. You can also place your own projects on Rotary Showcase and be proud for what your club has achieved. If you are a new member or newly elected club officer or committee chairman, then there’s information available within My Rotary to help you understand your role. There’s even a Learning Centre with a range of online programmes that aid Rotarian development. Go on, take the next step now and register on My Rotary if not already done so. It will enrich your Rotary understanding. How to Create a My Rotary Account Guide (pdf). Over 6,100 Rotarians have accessed Rotary Global Rewards in the first month since the 1 July, 2015 launch. WHAT IS ROTARY GLOBAL REWARDS? The Rotary Global Rewards program offers Rotary club members discounts on products and services for travel, entertainment, and merchandise. Rotarians can access the Rotary Global Rewards program from the Member Centre of the Rotary International website. Rotary Global Rewards offers discounts on car rentals, hotels, dining, and entertainment. You will find Holiday Inn, Hertz, and Apple as well as Official Rotary Licensed Merchandise (pins, shirts, etc.). See local offers to you. More products and services from companies around the world will be added throughout the year. Check back often to see what’s new in Rotary Global Rewards. Rotary President K.R. Ravindran (see 1 minute video) and Rotary’s Board of Directors developed the idea for the rewards program to help clubs enhance member satisfaction and retention. The program is also a way to thank members for their service and their generous support of The Rotary Foundation. Every active Rotarian is automatically eligible to participate in the Rotary Global Rewards program. If you’re an active Rotarian with a My Rotary account, you already have access to all special offers and discounts. If you need help creating an account, review the How to Create a My Rotary Account guide (PDF). WHAT REWARDS ARE AVAILABLE TO ME? Initially, the program will include discounts on car rentals, hotels, dining, and entertainment. More products and services from companies around the world will be added over time. IS THE PROGRAM AVAILABLE TO SPOUSES AND OTHER FAMILY MEMBERS OF ROTARIANS? The rewards program is for Rotary club members only. CAN I REDEEM REWARDS FROM MY MOBILE PHONE? Yes. Simply sign in to your My Rotary account using your smartphone or tablet. WHAT IF I HAVE A PROBLEM REDEEMING AN OFFER? For questions related to a specific offer, please contact the company directly using the contact information in the offer. If you’re unable to resolve the issue with the company, please tell us so we can troubleshoot the problem. Select the flagged link under Claim Offer. You can find Rotary Global Rewards by using the URL: www.rotary.org/globalrewards – Remember to bookmark this link once opened. Perhaps one of Rotary’s best kept secrets is Rotary Club Central. I wish my club had found this earlier. Only last month there was a repeated discussion, at yet another business meeting, about how much money we should send to The Rotary Foundation. Club members had forgotten that this had already been decided about ten months ago when our president produced a budget for this Rotary year and set goals on Foundation giving. However, nobody could remember what was said at our club assembly so the discussion went on and on and on. Some club members even forgot we give to The Rotary Foundation’s annual fund (about $100 per capita recommended) as well as the PolioPlus fund ($1000 per club recommended). This whole discussion was most frustrating to the majority of club members. If only we had a quick way of looking up our Foundation giving goals. Well now we have – it’s called Rotary Club Central. What is it? It’s simply a new online planning tool that helps all clubs set and track their annual goals and achievements. Why is it a secret? It must be a secret as 76 clubs within Rotary South East have yet to discover it and start to use this brilliant new planning tool. It showcases the important work that Rotary clubs do worldwide and provides information about the millions of service projects undertaken by Rotarians. What if your club’s goals change? No problem, all goals, volunteer hours and club expenditure on Rotary projects can be amended at any time. Who can use Rotary Club Central? All Rotarians can view the goals and achievements for their club. The current and incoming club president, secretary, treasurer, Foundation chair and membership chair can add and edit the clubs membership data and goals. How do I get to Rotary Club Central? Go to www.rotary.org/clubcentral. You need a My Rotary account on the Rotary International website to see Rotary Club Central. If you do not have an account, it is easy to register for an account. Rotary Club Central Workshop – a workshop was held on Saturday 11th April 2015 at Ratton School, Eastbourne. This was organised by AG Chris Brenchley for clubs in the East Sussex area. 16 people from 7 clubs (Eastbourne AM, Heathfield & Waldron, Eastbourne Sovereign, Bexhill, Eastbourne Beachy Head, Eastbourne and Hailsham) attended, and have now gone away to start inputting their club goals for 2015-16. Now is the time to start entering your membership, service project and Foundation goals for 2015-16. More workshops can be held if other clubs want to be let in on this secret too. Invicta Rotarians have just been collecting for two hours each over the weekend for Marie Curie Cancer Care. Volunteering service to our community is one of the main reasons people join Rotary. However, Rotarians are not alone in volunteering and helping others. There are many people in our local community who also give service to others; often over many years, and yet their efforts generally go unnoticed. So each year, the Rotary Club of Sittingbourne Invicta gives recognition to three local people, and we invite them to join us on a special Rotary Civic Awards evening. This year we have again found three very dedicated people who have served our local Sittingbourne community for many years. Our first nomination for a Rotary Civic Award comes jointly from The Friends of Milton Regis Court Hall and Sittingbourne Heritage Museum. “John Clancy is editor of the Sittingbourne Heritage Museum newsletter and journal, and he has contributed articles to both publications for many years. He is also editor of the magazine published quarterly by the Historical Research Group of Sittingbourne. He is the main correspondent for the Sittingbourne News Extra for the town’s clubs and societies and for several villages. 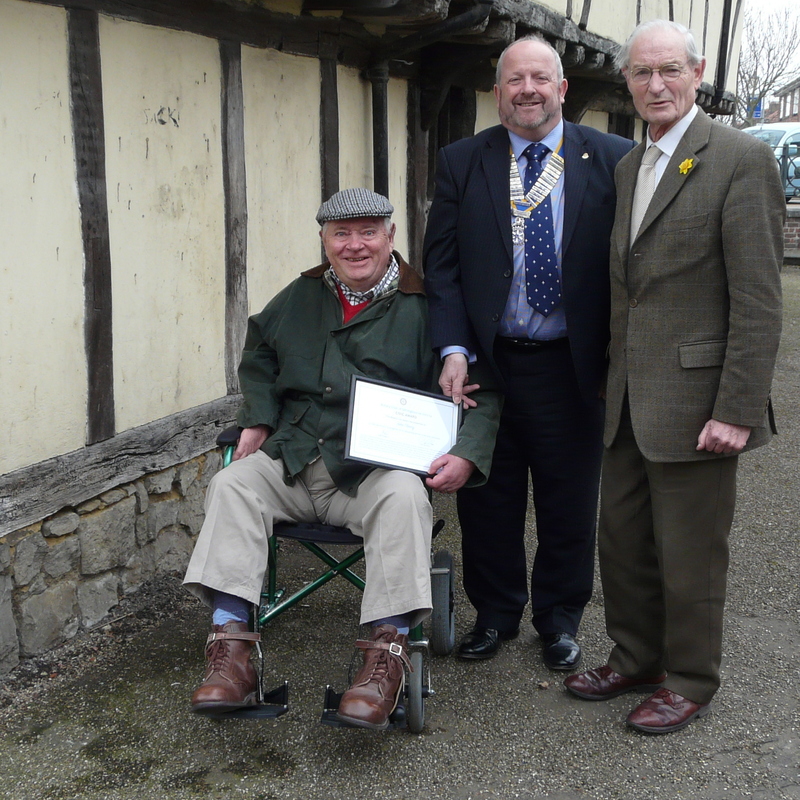 With his interest in the preservation of local heritage, John was instrumental in starting The Friends of Milton Regis Court Hall group in 2011, and continues to act as a Trustee and their Press Officer. Our second nomination for a Rotary Civic Award comes from The Salvation Army (Sittingbourne). “Louise has been actively involved with the Salvation Army since the age of ten. Throughout that time she has given of her time and skills without stint serving as Primary helper, Sunday School teacher, Record Sergeant, and Assistant Young People’s Sergeant Major. She is currently Corps Secretary and brings to this task her extensive administrative and IT talents and skills. Her work is most valuable to Corps Officers, Section Leaders and Community Sections alike with many depending on her for advice and more practical services. Our third nomination for a Rotary Civic Award comes from St John Ambulance in Sittingbourne. “Ken has been a member of St John Ambulance for 42 years, joining as a Cadet in Dublin, Ireland. He is a dedicated member of the Sittingbourne unit, and is now a Divisional Officer responsible for training and logistics within the unit. Ken has also been a member of Casualty Union for Kent for several years, an organisation that trains and supplies patients for training exercises, and he has assisted all of the emergency organisations. Ken is trained to Emergency Transport Attendant level in St John Ambulance, and regularly attends events and duties as part of an ambulance crew. Ken assists the South East Coast Ambulance Service with New Year’s Eve coverage and when winter weather causes a shortage of ambulances crews. Unfortunately Kenneth Shortall was not able to attend the evening event, so his son Christopher picked-up the certificate on behalf of his father. 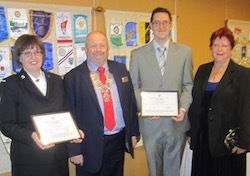 Our Rotary Civic Awards evening was on Monday 30th March 2015, and held at Hempstead House Hotel, Bapchild. By January 2014, new cases of paralytic polio had fallen annually from 350,000 in the 1990’s to an all-time low, and the disease remained endemic in only three countries: Afghanistan, Pakistan and Nigeria. However, by May/June 2014 the good news had been savagely reversed by outbreaks of paralysis across equatorial Africa from Cameroun to Somalia as virus was “exported” from Nigeria. There were outbreaks in Syria and in Somali refugee camps in Kenya plus an upsurge in remote parts of Pakistan. While the virus remains endemic in three countries, export to areas where vaccination levels cannot be maintained remains a constant threat. The instant response to increased paralysis rates was an aggressive campaign in the so-called “outbreak” countries in Africa where over 60 million doses of vaccine were used. Successful efforts to win hearts and minds in Nigeria, and particularly Pakistan, to overcome local suspicion and even violence achieved substantially increased vaccination rates. Now in early 2015 the good news, the very good news, is that no new cases have been reported from Nigeria for seven months and all the exported outbreaks have been wiped out. Pakistan is now seen as the key to ultimate success. But as the high season for virus transmission begins public health experts remain optimistic that global virus transmission can be stopped in 2015 and that the world could be declared polio free after three years without any new cases by the end of 2018. Since PolioPlus (the Rotary global contribution to polio eradication) was set up in 1985 Rotarians have raised $1.3 billion US and given millions of volunteer hours. We will carry on fundraising helped by a very generous offer from the Bill and Melinda Gates Foundation to match every Rotary dollar two to one up to an annual total of $35 million. This means that for every £1 we raise from an ever generous British public that £3 will arrive at the sharp end. At current costs £3 will buy six doses of vaccine to protect babies and small children from a lifetime spent in leg braces and on crutches. We can’t possibly stop now and look to your continued and very generous support. Two club members from the Rotary Club of Sittingbourne Invicta have been busy on the River Medway this week. Rotarians Jeff Hall and Richard Joy are crew members of Kingfisher, and they have been providing river trips for three Sittingbourne groups. Kingfisher is a purpose-built boat providing river trips to disabled and disadvantaged people of all ages. The boat is fitted with a hydraulic lift to help wheelchair users and others to get on board easily and safely, and can carry 12 passengers. Kingfisher operates from a marina at Wateringbury each weekday May to September each year. The Rotary Club of Sittingbourne Invicta has chartered Kingfisher for the past four years as part of the club’s Community Service within Sittingbourne. This year the club arranged five morning and four afternoon trips on Kingfisher. The morning trips were taken by children with special needs from Meadowfields and Westlands Schools. The afternoon trips were taken by people from Age UK Sittingbourne. Monday morning’s trip on the river was for five children with special needs from Meadowfields School in Sittingbourne. Kingfisher cruised down river to Teston where two of the children assisted with the locks. At East Farleigh, the children enjoyed a picnic lunch by the side of the river. On the way back to Wateringbury three of the children had a go at steering Kingfisher. Feeding swans and ducks on the river was also a highlight of the trip. 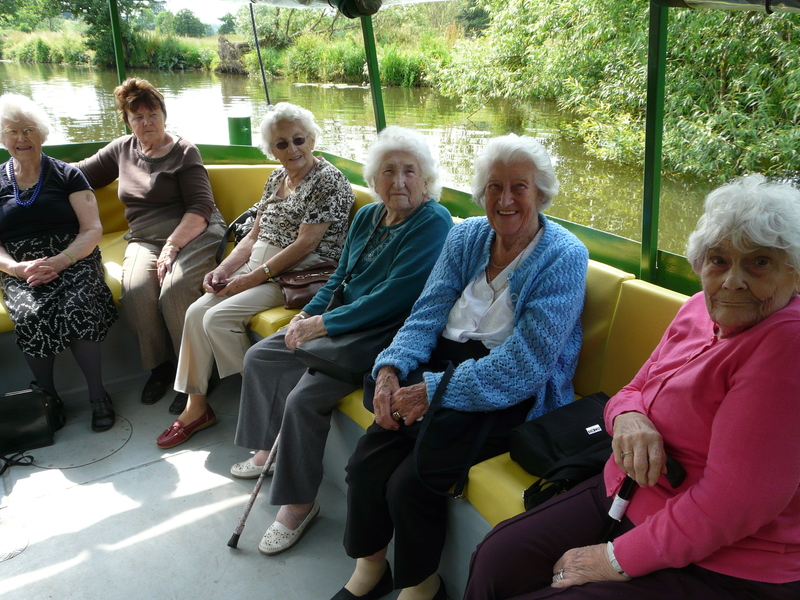 In the afternoon, ten people from Age UK Sittingbourne enjoyed another river trip in the sunshine. This time Kingfisher went up river to Hampstead Lock before cruising down river again to Teston Lock. Five real kingfishers were spotted by the crew of Kingfisher; always something to make the day complete. The Kingfisher Medway Trust is also supported by the Rotary Club of Maidstone Riverside. At 11am on a very hot Sunday morning, 309 registered runners set off for a 10K race from Westlands playing field in Sittingbourne along a rural route through the nearby Kent countryside. However, the day started much earlier at 7.30am for Invicta Rotarians and their family members and friends. Marquees were erected, signs and bunting put up, the finish gantry erected and the catering tent was got underway ready for the 9am opening of on-the-day registrations. A 2K Fun Run started at 9.45am whilst many of the runners were still arriving for the main event. Sfm Radio commenced live broadcasting from the site at 10am and a long list of people were assigned a few minutes to be interviewed on not only the race but other Rotary and club initiatives including our Caterham Seven Project, Polioplus and our Community Chest. By this time many runners had arrived and were inspecting four Caterham Seven cars on display. Each runner was given a chip which was tied to their trainers for recording race times. Club President Margaret Abram welcomed everyone to the event and finally the race started at 11am. First male home was Ben Tyler from Medway & Maidstone AC in a time of 33m 22s – the fastest time since we started this race four years ago. The first female home – for the third consecutive year – was Liz Weeks from Sittingbourne Striders in a time of 37m 34s. All finishers received a goody bag and a medal. This charity fundraising event was in aid of CLIC Sargent, Swale Youth Development Fund and other charities supported by the club. We were pleased to see CLIC Sargent with their colourful marquee on site during the morning. Our catering tent did a roaring business selling bacon rolls, cakes and teas/coffees/soft drinks. 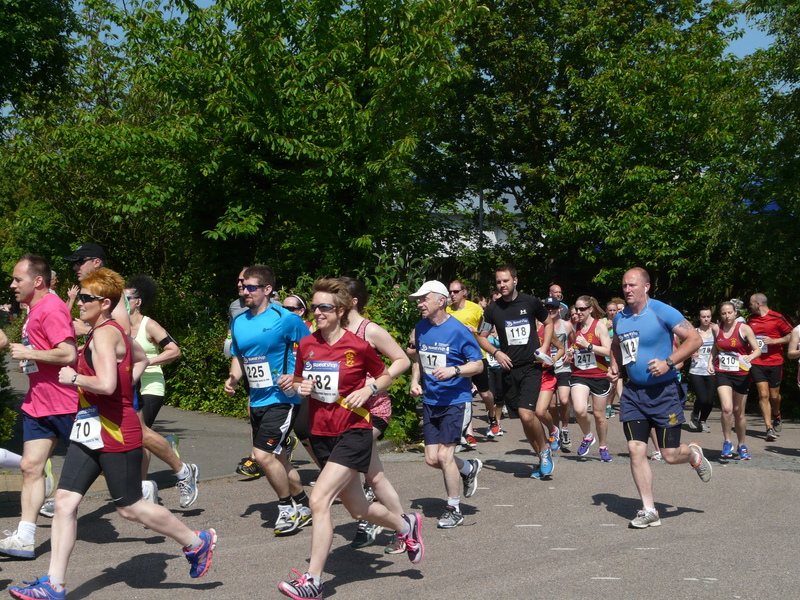 Our planning now starts for the 5th Sittingbourne Invicta 10K Race on Sunday 17th May 2015. President Margaret Abram welcomed RIBI President Nan McCreadie, together with DG Chris Barnett, to the Swale Skills Centre in Sittingbourne today, Thursday 13th March 2014. The visit was arranged as part of Nan’s tour of Rotary District 1120. The purpose of Nan’s visit was to see the Invicta Caterham Cars School Project; now in its third year. Two Caterham Seven kit cars have already been constructed at the centre in Sittingbourne, and a new group of young people from the Sittingbourne Community College commenced building a third car last September. The project provides practical skills to local young people and the opportunity for them to work as part of a team during the car’s construction. Rotarian Dudley Cramp, a Caterham Seven owner and founder of the project, showed Nan around the centre and explained how the project worked. Nan chatted with the young people who were fitting lights to the car at the time of her visit. RIBI President Nan McCreadie follows in the footsteps of HRH the Duke of York who visited the centre to see our car project a year ago almost to the day. Nan said she thought the project was fantastic as it provided a number of young people with engineering skills. 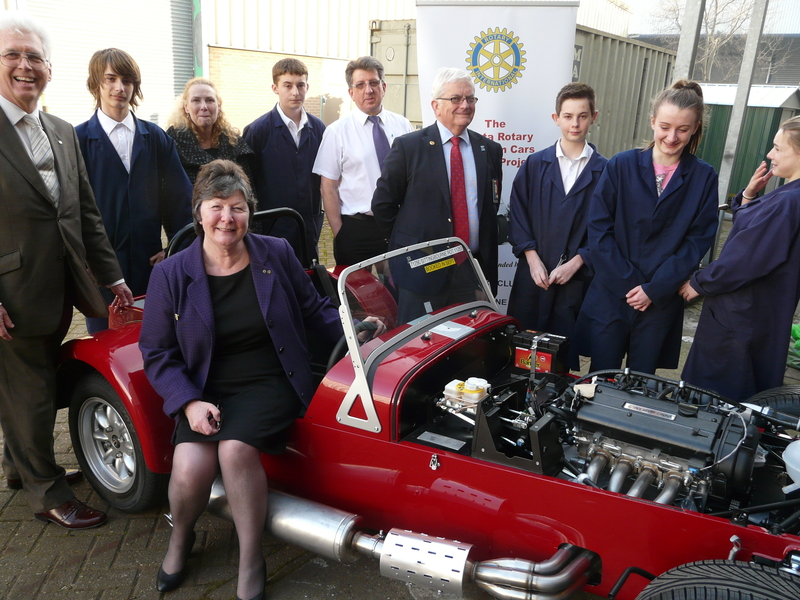 The Rotary Club of Sittingbourne Invicta is proud to be the first Rotary club within Great Britain and Ireland to partner with Caterham Cars and local schools in this way. Lost – Where’s Syd ? RIBI has set a challenge. The Challenge is to get 29 Rotary End Polio Now Bears to the Rotary Convention in Sydney by June 1st 2014. The aim is to raise awareness of the End Polio Now campaign and hopefully raise a little extra money for the campaign too. The 29 bears have been sent out to every District in RIBI. Boris, the London bear, is pictured above with his passport. Boris has already started to raise funds for End Polio Now. District 1210’s bear is called Monty and District 1260’s bear is called Charlie. They have both visited Allianz Park recently; the home of Saracens Rugby Club. But where is Syd? 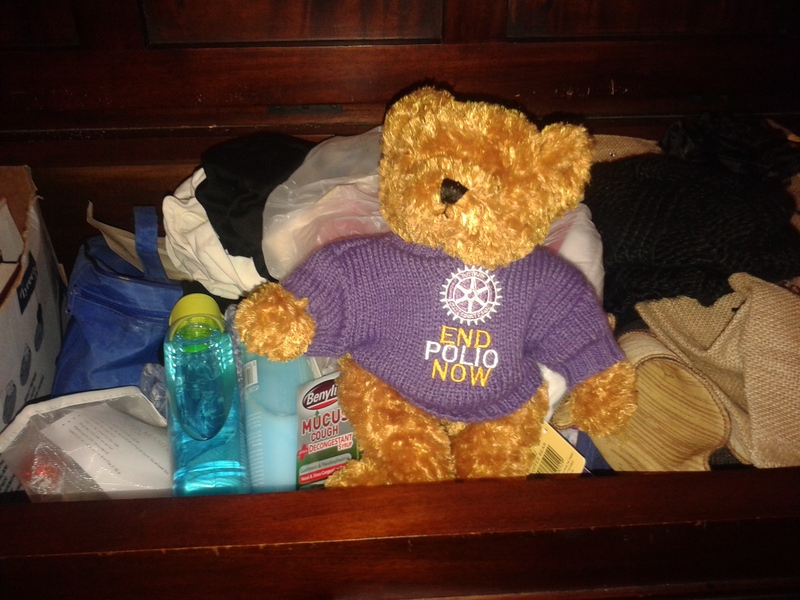 Syd is the District 1120 End Polio Now bear, but so far his whereabouts is unknown. Have you seen Syd? If you see a bear called Syd in District 1120, then please tell him to get in touch as he has work to do. The idea is that Syd will visit clubs within District 1120 and receive a stamp in his passport. Hopefully, he’ll have the opportunity of visiting many clubs before PDG Jeremy Voizey takes him to the Rotary International Convention in Sydney which commences 1st June 2014. Syd is really looking forward to meeting Rotarians within District 1120. He’s also looking forward to a chance of meeting his cousins, the North Sydney Bears rugby team and the Sydney bears ice hockey team in Sydney, Australia in June. We hope to give you a further update on Syd soon. Great news. We have found Syd. He has had a lonely three weeks stuck inside a hotel’s lost property box, and missed Christmas. He was left at the hotel on 15th Dec following a post-2013 Conference Committee dinner. How cruel is that? Anyway, he’s now safe and tucking into some Kent honey. You can follow Syd’s next few days in the careful hands of the Rotary Club of Sittingbourne Invicta on social media (below). October 24th is World Polio Day. Rotary International introduced this special day over a decade ago to commemorate the birth of Jonas Salk; who with his team discovered the first vaccine against polio in 1955. It is also the day each year Rotarians, and our partners in the Global Polio Eradication Initiative, remind the world that polio is still endemic in three countries and the fight to end polio is ongoing. 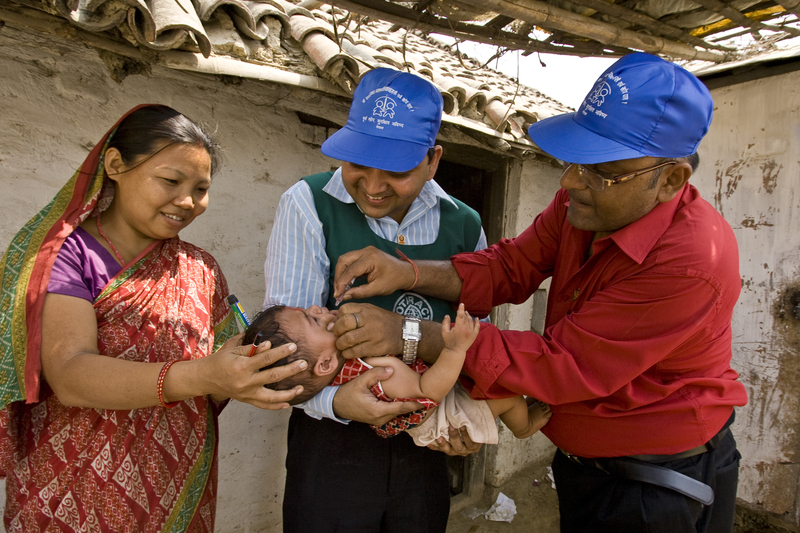 Rotary’s chief role within the Global Polio Eradication Initiative is fundraising, advocacy, and mobilizing volunteers. With 1.2 million Rotary members, Rotary International has an important polio advocacy role to play. So for 24th October 2013 I decided that I would continue my own polio advocacy in a small way. 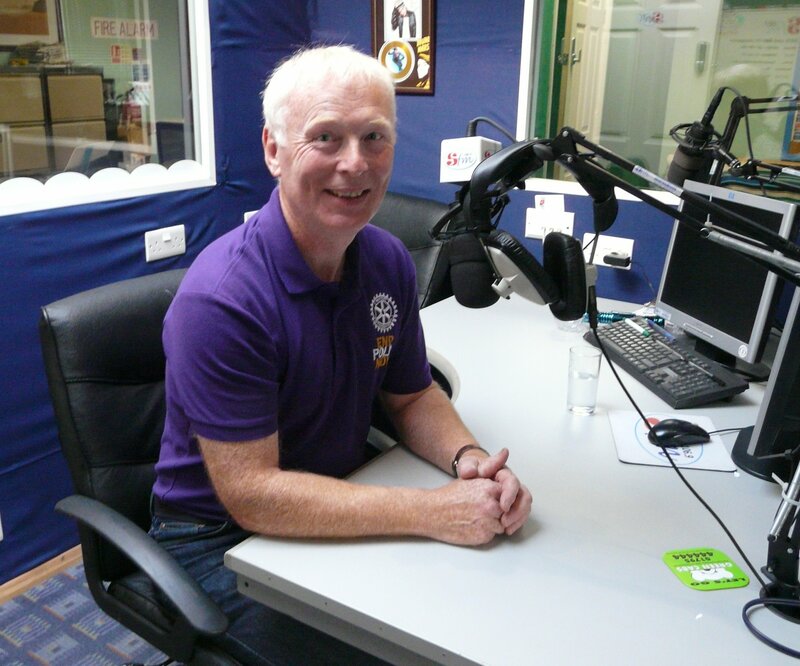 At 1.30pm on this day I visited Tony Weaver at Sfm Radio in Sittingbourne and was given 10 minutes to be an advocate for ending polio. Having explained that World Polio Day commemorates the birth of Jonas Salk, I went on to mention the work of Albert Sabin who developed an oral polio vaccine in 1988. This is what we’re using today, and it has reduced polio worldwide by 99%. This was also an opportunity of reminding the public of the Rotary Club of Sittingbourne Invicta’s Tour de Kent cycle ride, and I was able to report a successful £10,600 raised for the End Polio now campaign. RI President Ron Burton, Actress Archie Panjabi, polio survivor and Paralypian Denis Ogbe and Dr Bruce Aylward from WHO were a few of the presenters. Dr Bruce Aylward emphasized that the global fight is winnable, noting that the number of cases in the endemic countries –Afghanistan, Nigeria, and Pakistan – is down 40 percent in 2013, compared to the same period in 2012. He also said that the type 2 wild poliovirus has been eradicated, and said November will mark one year without a case of type 3 virus anywhere in the world. The “Livestream” broadcast was also interactive and around 175 comments and questions were received during the hour from Rotarians from over 18 countries. I asked a question about the 197 new cases so far this year of polio from non-endemic countries (Kenya, Ethiopia, Somalia and Southern Sudan) and received an immediate response. I also posted a comment on polio advocacy. As far as I could tell, I was the only person from RIBI to have commented. I was pleased to have had the opportunity of putting my club and Rotary District 1120 on to this world stage. Rotary Day is coming up in February 2014. This will be another wonderful opportunity for us all to sell Rotary purple crocuses, go on local radio, write a newspaper article or have a display in a local shopping centre. Remember, the polio end game strategy is to have completely eradicated polio by 2018 so we must continue our polio advocacy efforts and continue to donate to The Rotary Foundation PolioPlus Fund.